Emperor Vespasian started construction of the Colosseum in 72AD and his son Titus inaugurated it in 80AD. It had 80 entrances and seats for 50,000 spectators. The crowd could see gladiator fights, naval battles and wild animal hunts with lions, elephants and panthers. The original name was Amphitheatrum Flavium. (Flavius was the family name of Vespasianus and Titus). 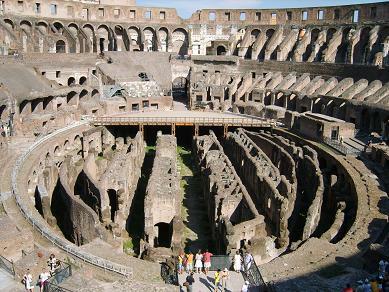 The arena got later the name Colosseum, likely because of its huge size. Another explanation is that a 40 meter high statue(colossus) of emperor Nero was standing next to it. The Colosseum is next to the Palatine Hill and the Forum. 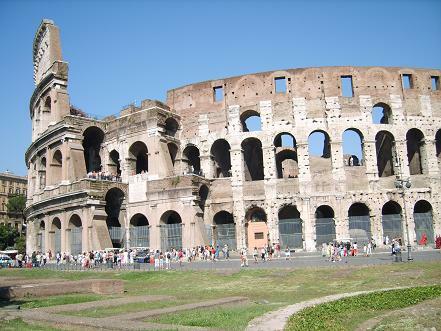 The nearest metro station is: “Colosseo”. 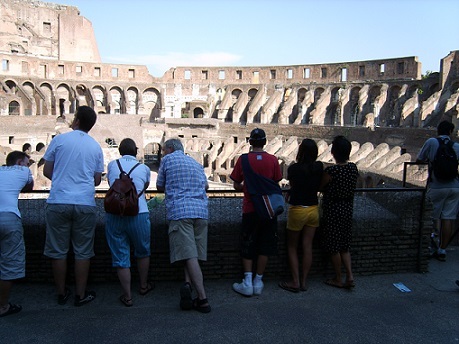 A combined ticket for Colosseum + Palatine Hill + Roman Forum cost €12. Youth under 18 have free admission. People with an age 18-25 pay a reduced price of €7.50. An ID-card is required to get discounts. When we were at the Colosseum there were long queues for the ticket counters. Fortunately, we had bought a combined ticket in the Palatine which is directly opposite of the Colosseum. People with a ‘Roma Pass’ have a separate entrance and our tickets were also accepted. In the Palatine was hardly a waiting time.